Imagery captured by Sentinel-1 on March 19 shows the extent of flooding (depicted in red) around Beira, Mozambique, after Cyclone Idai made landfall. A deadly cyclone that hit southern Africa left extensive flooding that looked like "inland oceans" in images from space taken just days after the storm made landfall. 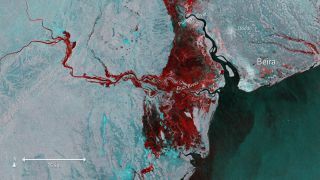 Sentinel-1, a satellite mission that's part of the European Union's Earth-observation program, Copernicus, captured imagery on March 19 that showed far-reaching floodwaters around Mozambique's town of Beira on the coast of the Indian Ocean. Cyclone Idai could turn out to be "one of the worst weather-related disasters" in the Southern Hemisphere, said Clare Nullis, spokesperson for the World Meteorological Organization. Cyclone Idai seen from space on March 13, 2019, west of Madagascar and heading for Mozambique. Herve Verhoosel of the U.N. World Food Program said that the flooding in Mozambique from above looks like "inland oceans extending for miles and miles. "This is a major humanitarian emergency that is getting bigger by the hour," Verhoosel said Tuesday (March 19). According to the Red Cross, 90 percent of Beira, which has a population of about 600,000, has been damaged or destroyed. With communication lines and roads wrecked, rescue efforts have been slow and many people remain cut off from aid. Sentinel-1 is tasked with, in part, mapping flooded areas — like the recent flooding in the Midwest — to help relief efforts in such situations. According to the European Space Agency, the images acquired before and after the storm offer immediate information to first responders on the extent of flooding and the location of the affected areas; eventually, that satellite data could also be used to assess environmental and property damage. The first Sentinel-1 satellite launched in 2014, and the second launched in 2016. The pair of polar-orbiting satellites have radar instruments that can "see" in the dark, as well as through clouds and rain. Sentinel-1 has also provided imagery to map flash floods in Laos and to show that an island where the Bangladesh government wants to house Rohingya Muslims is vulnerable to frequent flooding and cyclones.